This one has been in the pipeline for months. I must have bought the pattern before March because I know I bought the patterned fabric in late March, at the NEC, with the deliberate intention of making this dress with it. And there is a little black jacket with the same pattern which I made in early summer and have worn a few times. 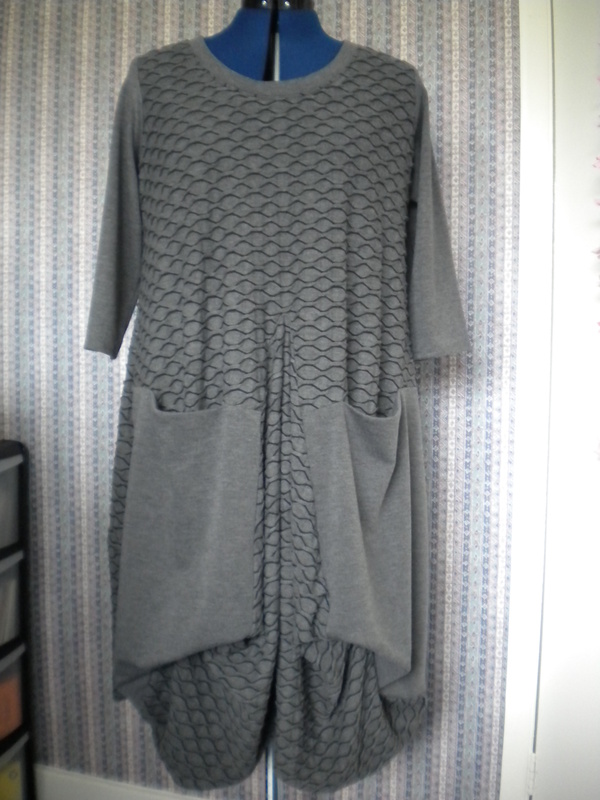 The plain grey is left over from the Coco top that I made a few weeks ago (and have worn quite a bit this week.) I guess that I have been waiting to complete my summer sewing before starting on Autumn garments, and Vogue does classify this as Average, which to me always indicates that the pattern is hiding an element of difficulty somewhere. The dress is constructed rather than made. There are many pieces, many of them cut only once from a single layer, and therefore you have to make sure that you cut them the right way round, especially if you are cutting ‘off pattern layout’ as I did. Anyway, I got them all correct first time, so I have obviously learnt some lessons from the past! Apart from being careful with the cutting and construction, the only difficulty is that there are two pivot points; one right in the centre front above the pockets, and the other is at the back. But I know the risks associated with sewing pivot points, and luckily the stretch fabric is quite forgiving, so after a bit of fiddling, I got to a satisfactory result at both points. Its the first time for a while that I have hand stitched a hem. I used to do it all the time, but several things I have made recently have suggested to machine sew, and typically I have twin needled the hems on recent knits. Not this time, I thought, sensibly! All of the hem is from textured fabric and in places it is quite thick with seams. Having top stitched the neck line, which is OK, I did not want flattened and stretched texture all around the hem. So out came the needle and thread, and I am sure that was the right thing to do. Given a draped front, levelling the hem was not an issue, although I did allow it to hang for several days before I sewed. I haven’t worn it yet, and my only slight concern is that the back stitches which attach the hem to the pocket bottoms, might not hold. Maybe I should keep a pin with me when I go out, just in case! I may need to adjust one side slightly anyway. I am very happy with the fabric; the weight is just right for the drape, and my pictures look quite close to the pattern pictures. I also think that the styles suits my body shape – focusing on an interesting design rather than any wobbly bits! So, how much will I wear it? Will I wear it for work or just ‘best’? (It will travel well, so maybe it will be brought into work duty). Will I make another? Time will tell, but having finished it just this morning, I can say that I am pleased with it so far. This entry was posted on October 11, 2014 by ann hebden in Dresses, Fashion, Sewing and tagged Dress, Dresses, Fashion, Handmade, knits, Sewing.